L'Occitane Shea Face Soothing Fluid - 40ml - $49 - with a natural complex of protective active ingredients including rose hip and calendula combined with 5% shea butter making it perfect for skin that is sensitive or weakened and suffering from tightness, redness and prickling or burning sensations due to damaging environments and daily aggressions. Sensitive skin will especially appreciate the preservative-free formula that is packaged in a completely sterile environment using hermetic packaging to protect the formula each time it is used. 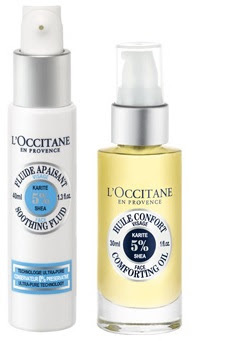 L'Occitane Shea Face Comforting Oil - 30ml - $44 - with a 100% natural formula containing 5% shea oil for its unique nourishing and repairing properties and marula oil for its antioxidant properties and fine, silky texture which easily absorbs into the skin and leaves a dry finish - to nourish and comfort very dry and sensitive skin. Just a few drops are all that is needed for an instant feeling for comfort and offers a new balance between nourishment and repair, protection and sensoriality for skin that feels stronger and soothed.